To prohibit or disallow installation of new gadgets on the desktop in Microsoft Windows 7, you must register a restriction in the registry. The message “Installation of desktop gadgets is managed by your system administrator” will then appear on the desktop, specifying the restriction. As always, before any registry tweak, it is suggested to create a manual backup of the registry. 2. Go to HKEY_CURRENT_USER > Software > Microsoft > Windows > CurrentVersion > Policies . 5. Name the new value as TurnOffUserInstalledGadgets and double click it to set is value to 00000001. (Easy cheat for newbies: hold the “0” key until it fills, delete the last zero and type one. There are 7 zeros and total 8 digits). 8. Close the Registry Editor and restart the PC. will appear on the desktop. 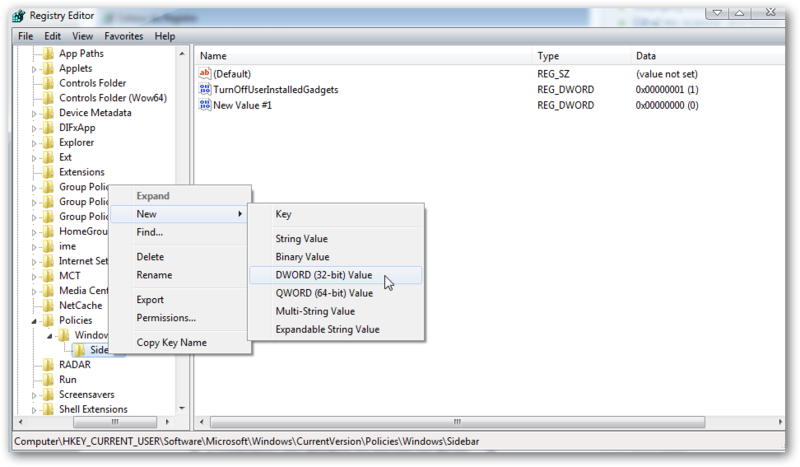 To remove the restriction, assign all zero (00000000) as the value data to TurnOffUserInstalledGadgets. Cite this article as: Abhishek Ghosh, "Disallow installation of new gadgets in Windows 7," in The Customize Windows, December 8, 2010, April 24, 2019, https://thecustomizewindows.com/2010/12/disallow-installation-of-new-gadgets-in-windows-7/.